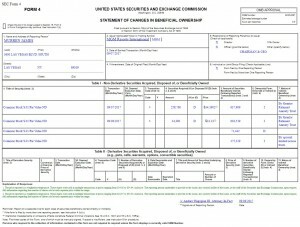 Browse: Home / CEO of MGM Grand – Which OWNS Mandalay Bay Casino Hotel Where Shooting Took Place – SOLD-OFF HIS MGM STOCK in the weeks before the attack! 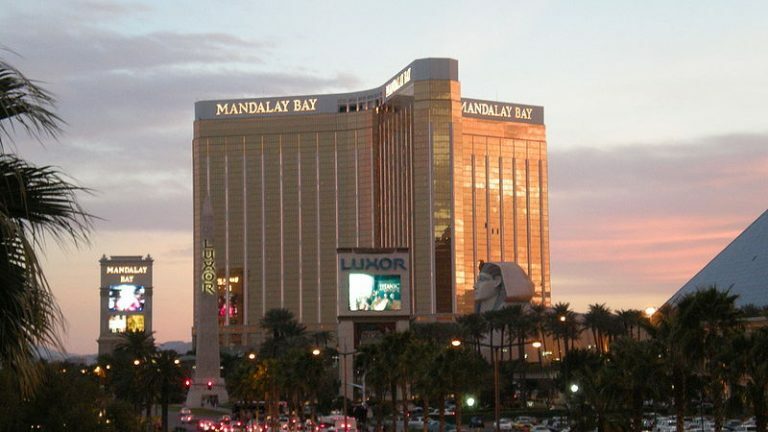 MGM Grand owns Mandalay Bay Casino Hotel in Las Vegas, from where a shooter attacked a nearby Country Music Festival, killing 59 and injuring 527. The Chief Executive Officer of MGM Grand, James Murren, suddenly began selling-off his MGM Grand Stocks in the weeks BEFORE the attack took place! Why? Did James Murren have prior knowledge that this attack was going to take place? Did he know that the value of MGM Grand stocks would plummet after the attack, and so he cashed-out before the attack happened? MGM Resorts International (NYSE: MGM) CEO James Murren sold 294,150 shares of the stock in a transaction on Friday, September 8th. The shares were sold at an average price of $34.08, for a total transaction of $10,024,632.00. Following the transaction, the chief executive officer now directly owns 71,442 shares in the company, valued at $2,434,743.36. The transaction was disclosed in a document filed with the Securities & Exchange Commission, can be seen in the image below (Click to enlarge) and can also be taken directly from the US Securities Exchange Commission website which can be accessed through this link. On Thursday, September 7th, James Murren sold 259,760 shares of MGM Resorts International stock. The stock was sold at an average price of $34.19, for a total transaction of $8,881,194.40. 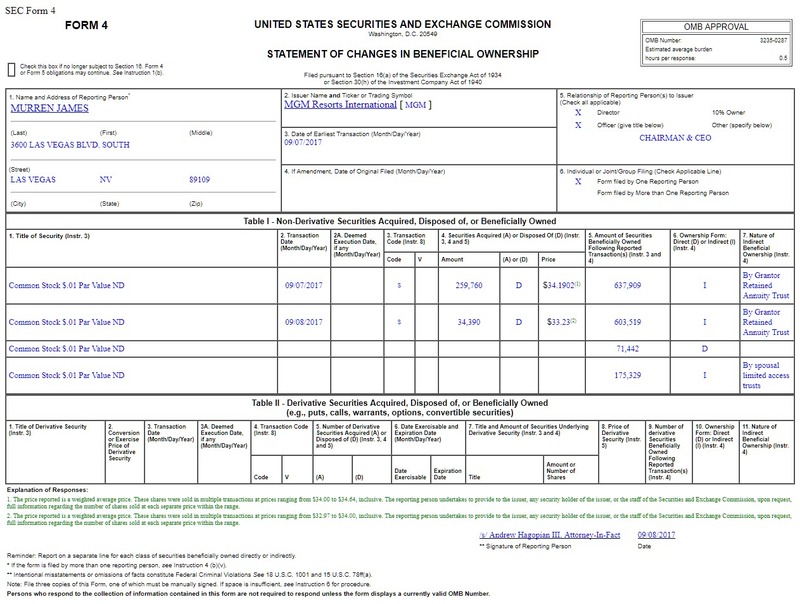 On Wednesday, August 9th, James Murren sold 57,269 shares of MGM Resorts International stock. The shares were sold at an average price of $31.54, for a total transaction of $1,806,264.26. On Monday, July 31st, James Murren sold 57,269 shares of MGM Resorts International stock. The shares were sold at an average price of $33.05, for a total transaction of $1,892,740.45. Why did James Murren start dumping large amounts of his own company’s stock weeks before the attack? Some are wondering if it may be because he had prior knowledge the attack was to take place. OK feds, do your stuff: Investigate! In the meantime, folks who hold stock in MGM Grand may wish to ask themselves if continuing to hold this stock is a smart move? Now that this information is out, it is likely that many, many people may choose to distance themselves from this corporation . . . and we all know what happens when folks start “distancing themselves” from a particular stock — the value tends to PLUMMET.